An artist rendering of the 3,000-square-foot atrium being built at Bethany Riverview. This year-round space provides a vital gatheirng area for residents, family members, caregivers and more. When Marek Otwinowski, an associate director with IBI Group, participated in a virtual dementia tour, he was given the simple task of pairing socks. But pairing socks — or simply finding his way around a room — became much more complicated under the simulated experience of dementia. Otwinowski’s physical and cognitive abilities were altered with disorienting noise, loss of touch and blurred vision. “It was actually amazing how we quickly forgot about some of the tasks or did them inappropriately,” he says. Otwinowski and a team of designers, contractors and construction managers participated in the tour while beginning work on Bethany Riverview, a 210-bed care community currently under construction in southeast Calgary. Jennifer McCue, president and CEO of the Bethany Care Society, says the virtual experience is designed to simulate the sensory challenges experienced by people with dementia. “It helps people walk in the shoes of someone with dementia and appreciate some of the challenges in the environment,” she says. According to the Alzheimer Society of Calgary, approximately 13,000 or more people in the city and surrounding areas are living with Alzheimer’s disease or related dementias. The number of new dementia cases — for Calgary and all of Canada — is projected to increase significantly over the next 15 years. Calgary’s current inventory of memory care spaces is mixed, with the majority of spaces in traditional settings. But, as the demand for care grows, McCue says that organizations like Bethany continue to shift away from hospital-type facilities to a more home-like approach. “One of our goals is to create an environment that is familiar to [residents] and allows them to live in a more normal environment,” McCue says. A participant interacts with his environment during a virtual dementia tour. Vision, touch and hearing are altered to simulate the experience of a person living with dementia. New design approaches to care communities include a campus-like feel when it comes to building orientation, location and layout. Small, single-purpose gathering rooms are created for private use instead of large, sterile, multi-purpose spaces. Home-like kitchens, dwellings and dining rooms are designed to replicate a familiar household atmosphere. Purposeful spatial organization includes disguised exit doors and way-finding features. Wandering is a common behaviour and safety concern among people with dementia, so providing a safe space for residents to roam and move about helps encourage physical activity and independence. “These things allow people to do the activities they normally do, just in a safer, more supervised environment,” McCue says. Bethany Riverview will also feature a 3,000-square-foot atrium, a year-round indoor space that allows residents to experience the familiar sights, smells and sounds of the outdoors within a contained environment. The project is a partnership between the Rotary Clubs of Calgary and the Bethany Care Society and will provide a gathering space for dementia residents, family members, caregivers and the wider community. Creating spaces that are familiar and purposefully designed can also help minimize the sometimes-devastating disruption that can occur when moving into a memory care setting. Twyla Hayes is a founder and senior care advisor of the Life House Care Home Society, a non-profit organization addressing senior care at a community level. Life House is currently building a 10-resident, medically regulated Memory Care Home in Calgary’s northwest neigbourhood of Renfrew. The project was made possible with the help of Sano Stante Real Estate, Jovica Property Management and Jigsaw Builders. Its inner-city location is significant. Hayes says one of the society’s goals is to prove that personal care homes can be easily constructed on standard-size lots, allowing residents to remain in their established communities. Hayes says this stimulates one of the most important aspects of dementia care — memory. Life House is designing its personal Memory Care Home in a way that addresses the specific design needs of people experiencing symptoms of Alzheimer’s and dementia. Stimuli such as smells, sounds and colour have several roles to play in mapping residents’ behaviour. Red plates, for example, can discourage eating — a useful tool for some people with dementia who require help in regulating their appetites. Hayes says that the Memory Care Home will also consider the needs of families. The Alzheimer Society of Calgary suggests that for each person diagnosed with dementia, 10 to 12 individuals are directly impacted. Hayes says that a small, personalized care home removes barriers that visiting family members often face in a typical, institutional facility. 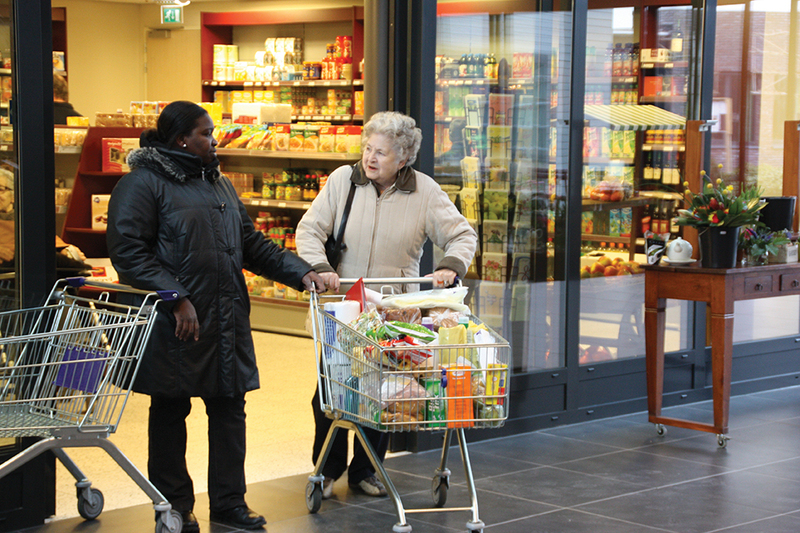 De Hogeweyk, a self-contained “Dementia Village” in the Netherlands is designed like a typical village complete with a park, grocery store and restaurants. 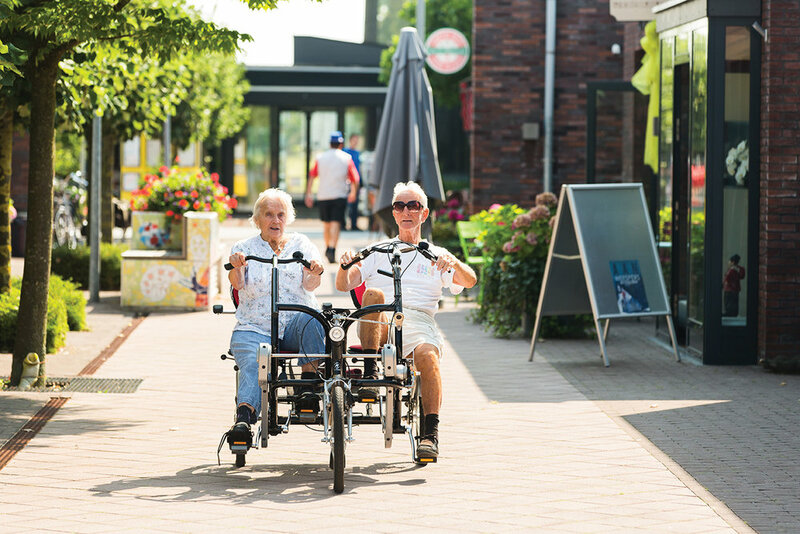 One of the premier models of dementia care is De Hogeweyk, a self-contained “Dementia Village” in Weesp, Netherlands, with houses, public spaces, a theatre, supermarket, restaurant and outpatient care unit. The village allows residents to maintain active, familiar lifestyles while aging in a protected environment. It has been a revolutionary care concept for providers around the world. Margot Schulman is a local designer who has visited De Hogeweyk and examined its applications in Calgary. She has a background in gerontology as well as a personal history of designing for those with cognitive impairments. Schulman’s brother suffered a traumatic brain injury at a young age, leaving Schulman and her family to navigate Canada’s continuing care system while advocating for his personal dignity. She works passionately to create meaningful spaces that focus on what the brain can do, as opposed to what it can no longer do. Schulman believes design is part of the solution to the ensuing care needs of Canada’s aging population. Schulman says that incorporating meaningful design on even the smallest of scales can promote health, safety and independence. Configurations of windows and artwork can be used to orient residents and trigger familiarity. The use of natural and artificial lighting helps facilitate time-of-day cues and healthy sleep habits. Enhancing independence also improves the quality of life for dementia residents and helps alleviate frustration, embarrassment and, potentially, a downward spiral of symptoms. Tragically, Schulman’s younger brother passed away at age 35. This is why Schulman believes that the final stages of life are a gift and an opportunity to express oneself profoundly. Even the smallest designer vision, she says, can help someone live his or her life in an easier fashion. Alberta Health Services Community Care Access is a single-point service for you and your loved one to begin a personal care plan. Community Care can help you access the appropriate level of continuing care depending on your specific individual needs.